When Donald Douglas accepted the challenge of creating a new airliner, the DC-3, his team fostered the growth of an airplane that would jumpstart an industry. But without the efforts of countless others that followed, as pilots, engineers, flight attendants, mechanics, ground crew–and the all-important passengers–the DC-3 would have faded into the annals of history long ago. But today, more than 80 years after her first flight, the DC-3 graces the skies of the 21st century. Crowds still gather to watch a DC-3 land, technicians revel in the sound of her rumbling radial engines, cargo haulers appreciate her ability to stretch to meet impossible demands, and, yes, pilots still dream of flying the greatest airplane ever built. 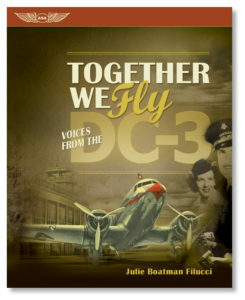 These stories come together in Together We Fly: Voices From The DC-3. From the newly minted pilot flying the line in the late 1930 to the hostesses who cared for passengers on those pioneering flights; from engineers who designed her to the women who riveted her together so she could go to war in great numbers; from the folks for whom the DC-3 meant a first airline trip to the children awestruck and inspired to fly after seeing her today–this book takes you into their hearts.